You can’t have social media without being social. And…you can’t really be social without being transparent. That’s why transparency beats privacy on social media…every time. Being private means to be holding something back, to be hiding something from public view…and ideally, social media is transparent, fully transparent. That’s what I believe, anyway, and that was the premise…kinda sorta…of the 2017 movie, The Circle. The Circle was based on a novel written by Dave Eggers in 2013. The movie is about a tech company called The Circle which places small cameras everywhere to provide real-time video of practically everything. It’s a little creepy, sure, and certainly scary for some. But it is my opinion that the premise of the movie, the pros and cons of being fully transparent, is something that not only those of us in social media and marketing will be dealing with more and more in the future, but also society at large. Brands, businesses, people who are using social media for professional reasons…those whose attention you covet will be far more attracted to you if you let down your guard and share who you really are with them. They will respect you for being just like them, human, as opposed to being some far-fetched, unrealistic image of perfection. That’s how it should be in both our professional and personal lives, if you ask me. 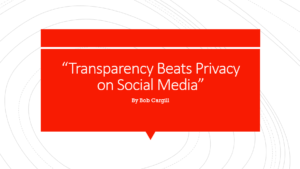 In my opinion, transparency beats privacy not just on social media, but in real life, too.